There are many schools of thought regarding mandalas, their symbolism, and their uses. For example, while there are certainly underlying themes shared across the globe, the ancient tradition of Celts, Buddhists, Native Americans, and Hindus differs greatly. This means that they each have a few unique aspects that the others do not. The mandala symbols are neither better, nor worse, only different. Actually, this is quite beneficial for us in the modern day, as it provides us with a great variety of options for symbolism, introspection, and growth depending on our immediate circumstances and desires. The most primary definition of a mandala can be attributed to ancient Buddhism and Hinduism, wherein the Sanskrit word for “circle” began to have morals and attributes attached to it. The circular theme is actually quite prevalent, as each culture using mandalas has some idea of continuity and the infinite. By studying this term and others across several culturally-specific uses, we can see the true (and versatile) message of the mandala and gain an accurate insight into both its origins across the world and its various purposes. When studying the mandala through the lens of geometry, a “circle“, we can see how the design affects meditation specifically. The concentric shape and design allows the relaxed mind to pull its attention inward and become aware of a deeper consciousness. The Sanskrit term “chakra” also falls in line with this method of thinking. In Sanskrit, this word chakra refers to a wheel, which is obviously the same shape as (and thus shares similar meaning to) a circle. In the Indian tradition, which uses chakras quite frequently, the seven prime energy sources of the body are represented in a visual and artistic sense by chakras. They are referred to, in English, as the root chakra, sacral chakra, solar plexus chakra, heart chakra, throat chakra, third eye chakra and crown chakra, in order from the lower part of the body up to the top. 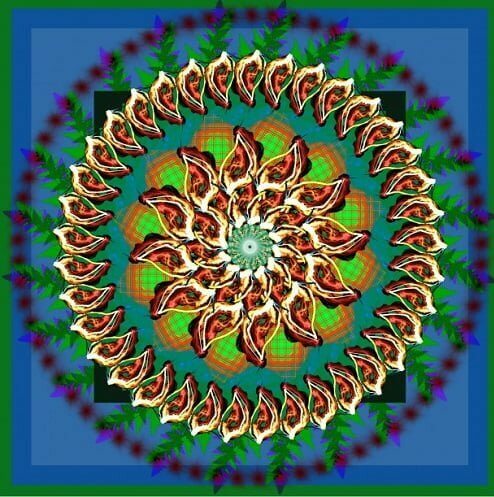 Thus, chakras can act as energy-themed mandalas. “Maha” is another term that is frequently paired with mandalas. It literally translates to mean “great” or “supreme” and can thus refer either to one’s personal positive energy or, more literally, the divine Creator that governs all natural forces of both this world and the universe as a whole. Correspondingly, we also have “vidya”, which literally means “wisdom”. Vidya is quite commonly paired with “maha” to refer to the supreme wisdom of the highest-ranking Hindu goddesses. They symbolize all that is good and wise within feminine divinity and are thus great for providing advice. In a somewhat similar fashion, “shri” refers to that which is sacred and holy. When we see a shrimandala, it is definitely expressing divine ideas, control, and intervention and should thus induce an extremely sublime meditative state. If you have ever participated in a yoga class, read a self-help book, or have researched anything to do with meditation, you may have heard of the term “mantra“. Quite simply, a mantra is a sound, phrase, or sentence that acts as a guiding power for the meditator. It is thought to be the sound of a specific god or goddess that will speak to you during your meditation. However, it is not common (and even encouraged) to form your own empowering mantra to call upon both in times of struggle and when you wish to relax. Mantras should not be abrasive or loud; rather, they should allow you to focus your consciousness internally and shut out the distractions of your external environment. Along with a mantra, some people choose to incorporate a “yantra” into their meditation process. A yantra is simply a visual version of one’s mantra, making it the perfect candidate for a very personal mandala. If you can find one, great, but with yantras it is certainly more empowering and personal to create one in your own unique vision.